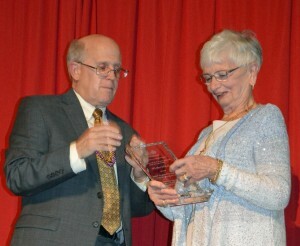 The SYFS annual gala was organized by a group of volunteer committee leaders and volunteers. (Front row, l to r) Terry Cassidy, SYFS director, Kathleen Keohane and Christine Mowry; (back row, l to r) Maria Munro, Michelle Duke, Sara Port and Lisa Easson. 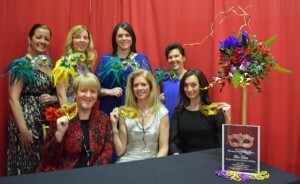 Shrewsbury – The 12th annual Shrewsbury Youth and Family Services gala was a night of fancy masks, sparkling beads, dazzling dresses and purple tablecloths. One room was lined with skirted tables featuring previews of auction items and numerous silent auction donations designed to elicit big bids. While the Struck catering staff passed around delectable appetizers, the crowd circled the tables bidding on everything from gift baskets to imaginative getaway excursions. Student volunteers from St. John’s and Shrewsbury high schools greeted and mingled with the guests handling the coat check, answering questions, and bringing winning bids to each table after dinner. In the dining room towering cascades of deep red and purple flowers and more masks provided by Danielson Flowers plus clever Mardi Gras decorations transformed the St. John’s High School room. Between perfectly prepared dinner courses, Gail Fabbri entertained with a variety of songs while wearing different outfits, and auctioneer John Terrio coaxed and cajoled the attendees to part with big bucks in the live auction. SYFS Board of Directors, presented her with the Harry S. Cutting, Jr. Award for her remarkable and selfless efforts to enhance the community. Lieutenant Governor Karen Polito bestowed a Governor’s Citation to LeBlanc and spoke glowingly about her own connection with this amazing woman. Representative Hannah Kane, R-Shrewsbury, praised LeBlanc and noted that she was a role model who inspired others to service. Senator Michael Moore, D-Millbury, added his encomium. This fundraiser raises a significant share of the funding for SYFS, a nonprofit agency that provides social services for anyone in the community from age 5 to 99 who needs a little help and support. Director Terry Cassidy was generous in her praise for the hardworking and dedicated volunteers and sponsors who make the annual gala a success.